(HONOLULU)–On the cusp of Earth Day, Hōkūleʻa will arrive at the Hawaiʻi Convention Center for a series of public events on April 19 and 20, 2019. 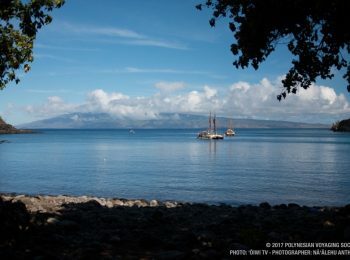 This last stop of the Mahalo, HawaiʻiSailwill mark the final chapter of the Mālama Honua Worldwide Voyage and will showcase the efforts by students and community organizations to restore the Ala Wai Watershed. The culminating event will be a fundraising gala on April 20, at which Polynesian Voyaging Society president Nainoa Thompson will share the vision and plans for Hōkūleʻa’s next voyage. Themed Nā Kilo Lani (meaning Stargazers, Charting the Future) will honor PVS’s legendary founders Ben Finney, Tommy Holmes and Herb Kane, as well as recognize three of PVS’s major supporters: The James and Abigail Campbell Family Foundation, Harold K. L. Castle Foundation and Annenberg Foundation. The event will also feature a dinner, silent auction, dockside Hōkūleʻa tours and entertainment by Chad Takatsugi. Details on tickets and table sponsorships are available at http://www.hokulea.com/gala/. For more information about the Polynesian Voyaging Society, visit www.hokulea.comor find us on Facebook, Twitter, Instagram, YouTube and Google+.